eGift cards are easy last-minute gifts that customers love to buy and to receive. Customer or staff activate card value automatically adding it to the customer’s prepaid mobile wallet balance. Customers can pay in-store or online with the prepaid balance. Customers can see easily check the balance of their redeed cards online and in your mobile app. 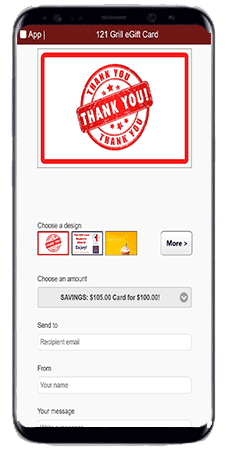 Prepaid gift cards are great for cash flow, directly build loyalty, and attract new customers. Entrevi-powerd egift cards are included with most of our Via 121 loyalty marketing plans.